Where is LDN’s Double Speed that they Promised for? After PTCL doubled Broadband speed for its customers, Link Dot Net immediately sent an email to all of its users and claimed that Link Dot Net will double its Broadband Speed for all of its subscribers (so that customers may not go away to PTCL). It’s been two weeks now but there is no word yet from LDN. Today I called their helpline and asked about status, on which the guy told me to hold on for just a week. He said they are working, and may take 7-10 days for upgrade. Further he told me that speed for all subscribers will get doubled in a single go (not like PTCL, which upgraded accounts in groups). I am sure Link Dot Net people are seriously working on this task – hopefully they won’t take longer or 1236 is an easy number to dial to get a PTCL connection; by the way some LDN users around me are already considering theiroptions. u know that when ptcl started in may-june 2007 they offered 256kbps in 1200rs and 2GB download limit which wasn’t enough, then start of November07 they increase downlaod limit to 4GB/month and free download from 1a.m to 8a.m. Oh man! I know what you mean. I’ve been waiting for the upgrade…I get the progress was a bit delayed cos of the recent conficker worm attack on both LDN & PTCL servers…let’s hope the change comes sooner than later. Also, did anyone else on this board experience the worm attack on their system?? How did you guys solve the problem? but my 512k connection upgraded to 1MB, i am living in RWP,and not facing any connectivity issue. I’d give LDN their time to upgrade the service as I am a very happy and satisfied customer. On the other hand, I’ve heard numerous issues related to PTCL DSL service along with their pathetic customer service. 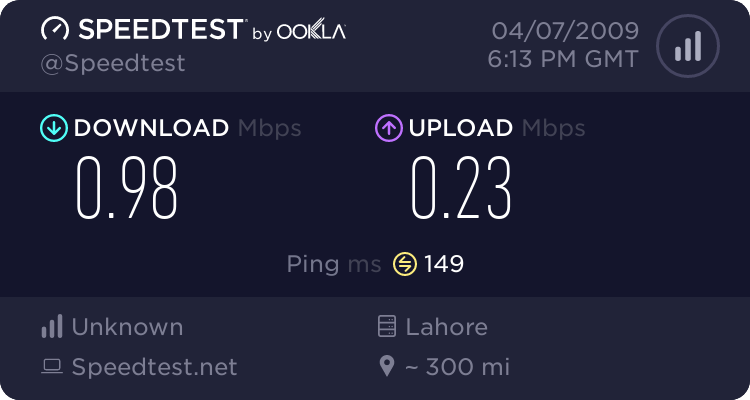 My Account has been Upgraded to 1 Mbps, But the Downloading Speed is still the Same as of 512K , I think both PTCL and LDN uses this tool as a marketing Cap, But they are betraying Customers by adding Downloading Speed Limit. End Result no use of Upgrading Connection Status. my connection also showing double speed, but in actual the download speed is the same as it was before. The same thing happening with me, My account upgraded to 1 Mbps from 512 but downloading speed never goes above 60KB. You can download conflicker worm remover from ptcl website. guy’s i really amazed when people say my LDN connection is not upgraded yet, because i got upgraded in week too and my friends circle , those who are using LDN services all are upgraded from their current bandwidth.. so i think u people need to call on LDN help line 111-600-111 may be problem will be at your exchange end etc. People (including me) are complaining that download speed is still the same though connection status is upgraded. they always say u have a problem in yr “exchange” thatway u dont get yr max speed. They r Liar . bloody liars, ive called them 3 times in the past one month and they keep on telling me that there is an issue of congestion in the exchange of my area and they are trying to resolve it. every week, they give a new time line. im thinking of changing my isp.